This past weekend The Corner Bank in Scarborough, Ontario played host to the OBSA (Ontario Billiards and Snooker Association) amateur 9-ball provincial championships. The event carried a generous $3000 in added prize money with the top four finishers receiving partial expenses to the Canadian amateur championships in Thetford Mines, Quebec taking place the last week of May. This provincial Championship was a culmination of an effort put forth between Greg Plester OBSA board member and OBSA board members and room owners John White and Frank Kakourous. This year saw the return of the OBSA as active promoter of cuesports in Ontario seeing them hold 10 regular season events at rooms all across Ontario. Paul Duell won the regular season points race with Brad Guthrie finishing second. It is a great breath of fresh air to see the game being organized at a provincial level with an official governing body after a long absence of OBSA run events. The OBSA also saw the players move towards the A, AA, AAA, Semi pro and Pro categories that mirrors the handicap system in Quebec which has proven to be quite successful. Minimal handicaps were the most common format for the regular season events and the provincial championships was a non handicapped event . 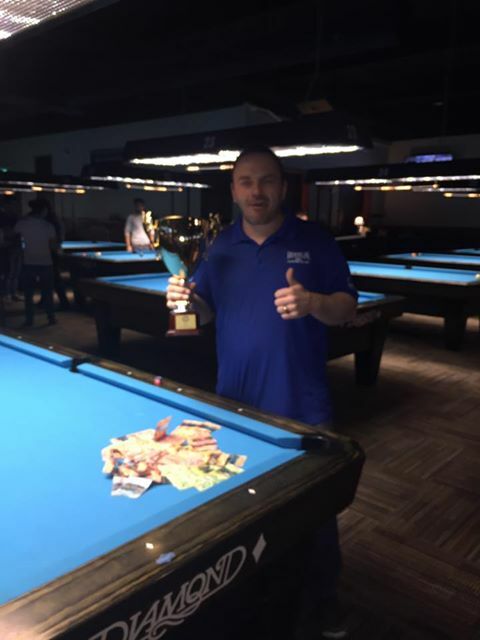 Winner breaks with the 9 ball racked on the spot was used thoughout all events. Fifty five players came out to compete at the corner bank, play started Saturday morning and a healthy player auction of $4500 kicked off the festivities. 12 players would come back for play on Sunday with Rod Arsenault facing off against Wayne Tate and Jeet Khandai against Sumon Sarkar on the other half of the bracket. Rod and Sumon would emerge from these matches to set up the winners side final. As the Losers side dwindled down Naomi Williams finished a great run on the losers side after losing first round finishing fifth. Jehlar Fenandez filled out the second fifth place spot, Wayne Tate came back all the way to third defeating Naomi Williams and Jeet Khandai along the way before falling to Sumon Sarkar which set up a rematch of the winners side final between Sarkar and Arsenault. In the extended race to 11 finals Sarkar got out to an early lead but it was all Arenault in the end taking home the title. Special consideration also goes out to Che Lemmon for receiving the most improved player award.